I had long debated going to the second day of the Sam’s Wholesale Grand Opening, but with a perfect storm of days I had to take off anyway, it made sense that I go ahead and dive in for the former Longhorn signal caller. 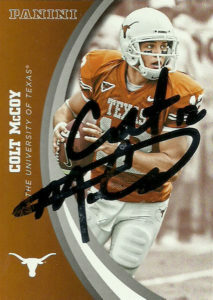 I had 5 or 6 cards of him, but outside of the Longhorns card here, I really wasn’t that jazzed about anything I had. Thankfully Spoodog offered me a fairly nice Playoff 2012 to get autographed. Colt’s career has been… bumpy… since getting traded from the Browns in 2013 to the San Fransisco 49ers for low end picks. He didn’t look all that spectacular in the preseason, but still managed to do mop up duty in 4 games behind Colin Kapernick. After the season Colt signed with the Washington Redskins. The collective brains of the NFL yawned at the signing. (I myself had hoped he’d be brought in by the Texans.) Most pundits had written McCoy off and now going up against RGIII and Kirk Cousins, Colt managed to claw his way onto the roster and patiently bide his time as the best 3rd string quarterback in the NFL. McCoy eventually got his shot as injuries and inconsistency plagued the Redskins at quarterback. He’d lead the team to back to back exciting victories over the Titans, and then the heavily favored Cowboys. Injured late in the season, his performance was good enough to earn him a new contract with the Redskins. The first few people through the line got way too many multiples signed. This ruined it for the rest of us. 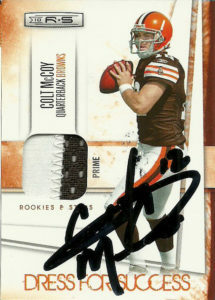 Colt’s signature is not a quick one, taking roughly 15 seconds to complete for each card. With a decent line building, this caused the gatekeepers to ask us to limit our requests to two a person. It was not unreasonable at all- but with them not patrolling the fans at the front with McCoy, people abused it anyway. I decided 3 was not unreasonable for me to get signed as that was my original thought. When I spoke to Colt, I told him that his heroics in the Redskins Cowboys game was the stuff of legend. He grinned from ear to ear and told me it was one of his fondest memories in the NFL. He also told me that he prefers Colossians 3:23 as his testament verse of choice. 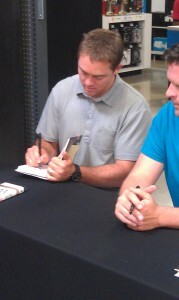 Colt McCoy is considered a Longhorn Legend. During his reign at quarterback under the stewardship of head coach Mack Brown at the University of Texas, McCoy set multiple passing and NCAA records. 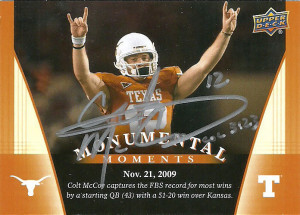 The starting quarterback for the Longhorns from 2006-2009, Colt had big shoes to fill after the departure of Vince Young. Starting as a true Freshman, McCoy was 217 of 318 for 2,570 yards, 29 touchdowns to 7 interceptions. Accolades begun with being named College Football News Big 12 PotY and also as QB of the “All Freshman Team”. With his role as starting quarterback firmly established, he’d throw for 3,303 yards and 22 touchdowns his Sophomore year in 2007. Finally back to the National stage in 2008, Colt threw for 3,859 yards, competing a national high 76.7% of his passes, for 34 touchdowns, to only 8 interceptions. The team cruised to wins over 3 ranked opponents, included #1 ranked Oklahoma, but UT finished 3rd in the national rankings. 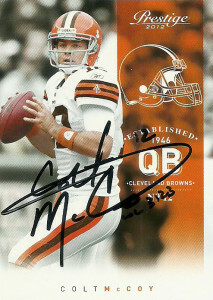 McCoy set many school records including: most career wins, most career passing yards, and most career touchdowns. The AP named Colt Big 12 PotY, he finished as a runner up (to Sam Bradford) for the Heisman that season, and won the Walter Camp, Davey O’Brien, Johnny Unitas Golden Arm, Manning, Maxwell Awards. Angered over their snub for the National Championship, the Longhorns channeled their frustration into a 24-21 victory over Ohio State in the Fiesta Bowl. Colt threw for over 400 yards and won the Offensive Player of the Game Award. In 2009, McCoy matured as the true leader of the Horns offense. He threw for 27 TD to 12 picks, and again led the nation with a 70.6 completion percentage as the team went 12-0. With a date against Alabama for the National Championship, the Longhorns looked to challenge the Crimson Tide. Unfortunately Colt pinched a nerve in his throwing shoulder early on and watched from the sidelines as the team fell to the Tide, 37-21. I still feel that if McCoy had not been injured the season would’ve ended with a different National Champion, but I digress. Subsequently, the school has retired Colt’s number 12 from use. He set the NCAA record for most career wins at 45 and finished with 13,253 yards and 112 TDs. Because of his injury, Colt did not participate in the 2010 NFL Combine. He spent much of his time rehabbing with a target date set for the UT Pro Day workout. The responses were generally mixed with coaches being impressed by his general footwork, his ability to hit targets, and taking on all the various challenges and throws that QB prospects are required to make successfully. Many scouts though did not like his ‘average size’ and felt that his arm strength was not well measured. At some point before the draft, the Cleveland Browns under then head coach Eric Mangini, and GM Mike Holmgren became enamored with the signal caller. 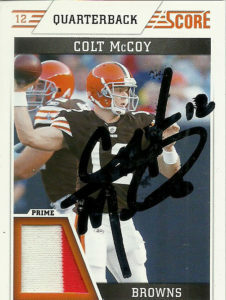 The fans were even more enthusiastic about Colt, and desperately wanted him as their quarterback of the future. As both Bradford and Tebow went off the board early, Browns fans bit their nails feverishly until the Browns finally pulled the trigger in the 3rd round (#85). The franchise was ecstatic to have him. He’d go in as the #3 behind newly signed Jake Delhomme and career backup Seneca Wallace. The Browns immediately had problems at quarterback with both injury and ineffectiveness limiting both Wallace and Delhomme. Colt would be forced into the lineup by week 6. After a trial by fire against the Pittsburgh Steelers where he threw for 281 yards and a touchdown, in a 28-10 loss, Colt showed what he could do by racking up wins in the next two weeks versus the New Orleans Saints 30-17 and the dominant New England Patriots 34-14. In both games, Colt ran a efficient, yet unspectacular offense, minimizing his mistakes, and completing high % passes. He’d share time with the two quarterbacks throughout the 2010 season with perhaps his best game coming against the Cincinatti Bengals in a 19-17 loss, where Colt finished 19 of 25 for 243 yards and 2 touchdowns. 2011, was a year of immense highs and lows for Colt. Handed the keys to the franchise, Colt came out and started right away for the Browns. A lot of excitement surrounded the team after they got off to a 2-1 start, but the team then dropped 5 of the next 7 games. While the team was competitive in quite a few of the games- losing contests against the Rams by 1, the Bengals by 3, Jacksonville by 4, and the Raiders by 6, it was in week 13 of that season that McCoy’s future with the franchise took an odd detour. During a 14-3 loss to the Pittsburgh Steelers, Colt suffered a monster hit from linebacker James Harrison. Colt- visibly shaken, returned to the sideline and then back out onto the field to throw 2 errant interceptions. It was later revealed that he had suffered a severe concussion, and played the majority of the game in a fog. Things got even more complicated when McCoy suffered the indignation of sports pundits, and then his family jumped into the fray to Colt’s defense. Colt spent the rest of the season on the bench, but his response was a lightning rod on team, league, and medical staff’s, underwhelming response to the severity of concussion risks. On top of that, former players had recently sued the league about their response to concussions, making the NFL and the Browns look stupid. McCoy spent the rest of the season on the bench. He finished the season 4-9 with 14 touchdowns to 11 interceptions. In the offseason, Eric Mangini was fired by the franchise. Hand picked offensive minded Pat Shurmur was brought in to coach the team in 2012. 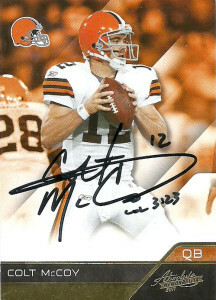 Making a quick read, Shurmur decided to draft 29 year old quarterback Brandon Weeden in the first round. While the team tried to make it appear that there was a quarterback competition between Colt and Weeden, it was obvious to all they had already handed the starting job to Brandon. Colt still put on a good show and supported Brandon, despite Colt’s superior preseason. McCoy got little playing time in 2012. 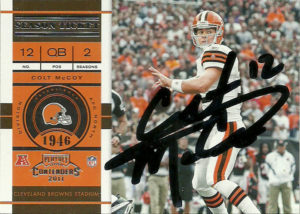 He played during a 34-12 loss to Denver in largely mop up duty, throwing for 79 yards and a touchdown. With new ownership in hand for the Browns, Pat Shurmur was one and done. Also gone was GM Mike Holmgren. 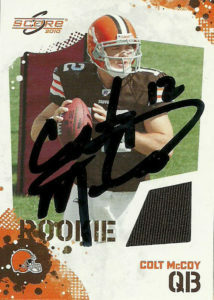 The Browns hired Rod Chudzinski, and signed veteran Jason Campbell to back up Weeden. After debating on what to do, it was obvious that McCoy was now expendable to the team, so the Browns opted to trade him to the 49ers for a few late round draft choices, where as of 2013 he backs up Colin Kapernick. 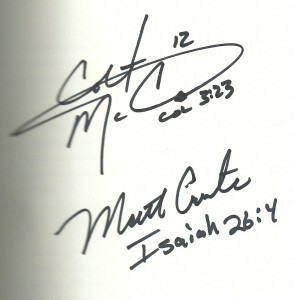 I had gotten wind through the Texas Autograph Club’s message board system of an appearance by Colt at a local grocery store to sign copies of his book “The Real Win”, that he co-wrote with his Pastor. Getting there about 30 minutes early, I was surprised to find the line was already fairly long, and a message on the posters there stating “COLT MCCOY WILL NOT SIGN OUTSIDE ITEMS”. I got a bit panicked and a bit annoyed, -because I really hate that mentality, but in the end Colt was more than happy to sign his UT card (and a book that I gave to my friend Josh) after we had missed out at his football camp last year. I still have a UT card or two more that I’ll need to track him down for, but in the meantime, I am quite happy with this addition to the HoF. The verse selected by Colt is from Colossians 3:23- “Whatever you do, work at it with all your heart, as working for the Lord, not for human masters,”. Colt is religious, and his book represents that, but he doesn’t wear it like a badge, and I respect that. Considering that guys like Tim Tebow have this entourage following them around, Colt does it without the controversy, and I consider this more ‘securely Christian’ than preaching the word at everybody in everything you do.